The Russian ShKAS (Shpitalny-Komaritsky Aircraft High-Speed Machine Gun) is a machine gun design form the 1930s that doesn’t receive nearly enough attention. It was the result of a need by the Soviet air force for a very high rate of fire machine gun for arming aircraft. A high rate of fire tends to be a disadvantage in infantry machine guns, as it is not generally more effective than the typical 600 rpm and requires more cooling and ammunition. In an aircraft, however, opportunities to fire and hit another flyer are fleeting, and it is imperative to have as many rounds down the barrel as possible during those moments. 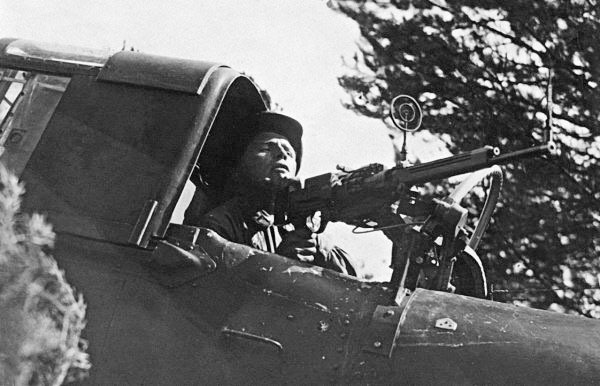 In the US during WWII, aircraft armament was typically Browning guns with the operating parts lightened to increase the tare of fire (the ANM-2, for example). The Russians, however, instituted a program to design a dedicated aircraft gun from the ground up during the early 1930s and the result was the ShKAS (often claimed to be the first purpose-built aircraft gun, rather than an adaptation of an existing infantry gun). The obvious notable feature of the ShKAS is it’s eye-opening 1800 round/minute rate of fire with a single barrel. The was possible primarily because the action was designed to minimize movement of the cartridge cases and allow a very efficient (and thus very fast) firing cycle.The gun fed from a disintegrating link metal belt, using 7.62x54R ammunition. Visually, one of the first things you will notice on the gun is its rotary feed system. This is sometimes mistaken for a revolving chamber, but it is actually a mechanism just to strip rounds out of the ammunition belt.The belt is loaded into the bottom of the cylinder, which turns one increment per shot fired. The cylinder has cutouts to hold 10 cartridges, and a helical cam which extracts the rounds just a slight bit with each movement. So the action of pulling a cartridge out of the belt is spread over 10 firing cycles of the gun, making for a very smooth action without the strong jerk required by a typical mechanism. As we say with shooting, slow is smooth and smooth is fast. Once the cartridge is fully retracted from the belt, it is fed down a ramp through the center of the rotary parts and into the chamber. The gun is gas operated, with a piston located above the barrel. The bolt is a tilting design, which requires a minimum of movement to lock and unlock. 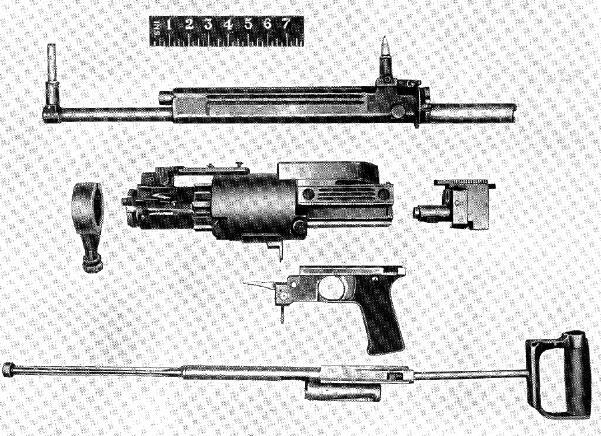 The bolt is pushed up against a locking shoulder in the top of the receiver to lock, and the gas piston pulls it downward upon firing, somewhat like a Bren gun. For initial loading, ten rounds must be manually fed into the delinking cylinder, which is done with a handle located on top of the gun. Then the handle at the rear of the gun is used as a manual charging handle (it has a release button which must be depressed to allow this, so it can be used to maneuver the gun during firing). 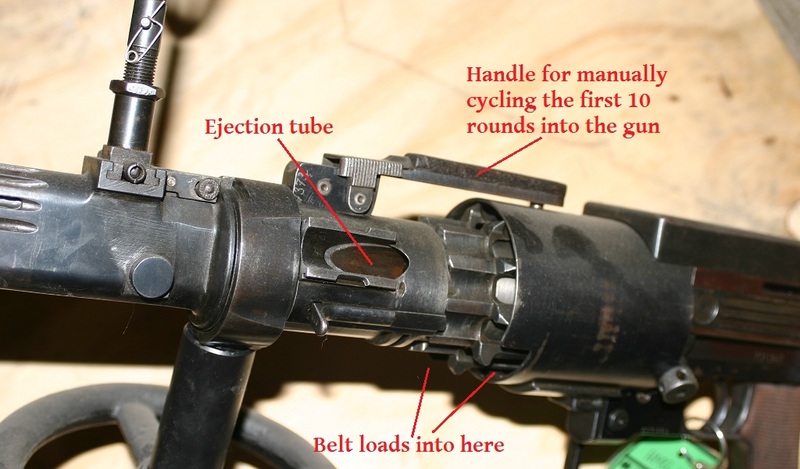 The ejector is a lever that comes in from the right side and pushed the empty case laterally off the bolt face, whereupon the forward return movement of the gas piston pushes it out forward through a tube to the left of the barrel. The first production ShKAS guns were made in 1933, and its first combat use was in the Spanish civil war. Continuous development was made during the 1930s, and the gun’s reliability and durability were steadily improved. Because of its extraordinary rate of fire, the ShKAS was subject ot a number of problems that simply weren’t encountered by infantry gun designs. For one, the lifespan of a mainspring in the early versions of the gun was a mere 2500-2800 rounds no matter what type of steel or wire size was used. 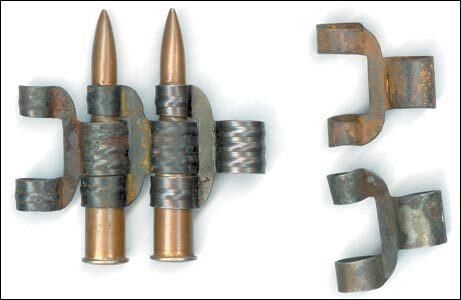 Ultimately a solution was found with braided wire springs, which were much more durable (the Germans would later use this type in the MG42, and the Russians in the AK hammer spring). Another issue that cropped up was ammunition reliability. Misfires are a nuisance in ground guns, but deadly in aircraft guns, where they cannot be cleared and leave a pilot unarmed. This was thoroughly learned in World War One, and ammunition for aircraft guns was often made to a higher standard and kept separate from normal stocks (WWI pilots would often check the OAL of every single cartridge while hand loading them into belts to ensure uniformity). Well, in addition to the need for perfect reliability, the ShKAS fired so fast that it put tremendous strain on cartridges. As a result, special ammunition was made for the gun, with thicker primers cups and case heads, and bullets firmly crimped into the cases. In an effort to increase lethality, AP, API, APIT, explosive, and incendiary bullets were also developed for use in ShKAS ammunition. As a side note, cartridges from the ShKAS production lines (including some of the exotic explosive and API) which did note meet the stringent QC standards but were still functional were often sent to snipers and infantry units. They were particularly accurate due to more precise powder charges, but did not shoot to the same point of aim as standard ball. Some claim that there rounds are higher pressure than standard ammo and unsafe for use in rifles, but this is not true. By 1941, more than 34,000 ShKAS machine guns had been produced, and acquitted themselves very well in the field. They were made in several variants, including wing-mounted, flexible, and synchronized for different applications. Several other versions were experimented with or made in small quantity like the reciprocating-barrel UltraShKAS (rate of fire: 3000rpm) and a mechanical linking of two ShKAS guns to achieve a combined rate of 6400rpm. 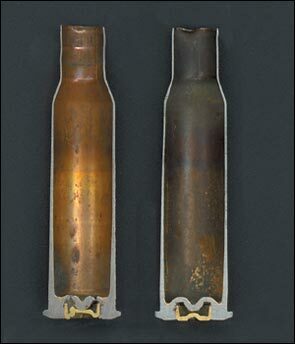 These were not widely used, though, as the 7.62m cartridge was unable to keep up with improvements in aircraft armor. Instead, the basic design was scaled up to produce the 20mm ShVAK cannon, which was very successful (and a subject for another article of its own). I wonder if the Russians used it for the infantry. That would be insane! Imagine you are a German. You see a Soviet MG. You’re like, “Oh, it’s just another weak Slav gun.” You aim your rifle at it, then suddenly “Rat-tat-tat!”, and you have about fifty bullet holes in your chest. One thing I forgot to mention was that the Germans did try to make a copy of the ShKAS in 8mm. However, the de-linking action is done by a rib acting on the rim of the cartridge – it works great with a big rimmed round like 7.62x54R, but adapting it to a rimless round like 8mm Mauser was a total flop. The mechanism ended up being much to complicated to work reliably. 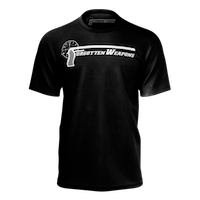 Ian, many thanks for adding this excellent article as a follow-up to the discussion thread we had about Russian aircraft guns in the “Saturday Wingshooting” post! I think this might spur a continuation of the interest in these weapons. Did any of these guns come to the USA and get registered? Be nice to see one and better yet, see it get fired. The closest the Germans got to a ShKAS equivalent in terms of its intended combat role was the recoil-operated Mauser MG81 aircraft gun, which weighed only 6.5 kg/14.3 lbs and had a cyclic rate of fire of 1400-1600 rds./min., versus the gas-operated ShKAS’ 10.5 kg/23.1 lbs and 1800-2000 rds./min. In order to increase the available weight of fire, Mauser later produced the MG81Z (“Zwilling” or twin), which was essentially two MG81’s paired together as a single two-barreled gun and fired via a common trigger mechanism. The MG81Z weighed 12.9 kg/28.38 lbs. and had a cyclic rate of fire of 2800-3200 rds./min. For additional comparison, the later Ultra-ShKAS and Savin-Norov machine guns were able to generate 2800 and 3000 rds./min. respectively, and still from a single barrel with no added weight penalty compared to a twin-barrel set-up. Excellent! This comes almost as “on order”; just wonder when FW wil start to charge “access fee”…))). One thing which hits me while looking at details is the finesse it has. It is contrary to typical perception of ‘Russian quality’ work; of course I realize this is not infantry weapon. Do you think the ShKAS feed influenced GE engineers when they were developing the Vulcan / M134 delinker? The Vulcan delinker seems to be a derivative. The very first production Tupolev SBs were still armed with DA machine guns and so were also the first specimens of that then ultra-modern, fast twin engined bomber sent to Spain in October 1936. Initially, the Soviet ‘advisers’ in Spain were quite relutanct to use the gun under real operational conditions for fear of having its secret revealed to the Spanish Nationalists and hence to their German and Italian allies, but the bomber pilots flying the SB soon convinced them otherwise. The I-15 fighters also arrived armed with another type of aircraft machine gun, the PV-1, but these were also duly replaced by the synchronised version of the ShKAS. The gun remained in service after the end of the Spanish Civil War in all the Soviet aircraft ‘inherited’ by the victorious Nationalists, in the newly formed Ejército del Aire. As a side note, the Spanish arsenals are rumoured to have produced reverse-engineered parts to keep the ShKAS going (barrels, for instance), but I never found any firm confirmation of it in Spanish sources. I read somewhere that ShKAS’s action is one of Berthier type. I searched for MG of this name however found just Vickers-Berthier LMG which had been made primarily in India. Ian’s description and pictures he posted are pretty good, but I am interested more in genealogy of this action and reason they used it for. I wonder if anyone knows some more in that direction. Denny, I was just thinking — There is a pretty comprehensive but well-condensed technical and historical description, along with photographs, of the Vickers-Berthier 0.303″ LMG from pages 92-93 and from pages 104-108 in Ian Hogg’s “Machine Guns : A Detailed History Of The Rapid-Fire Gun 14th Century To Present”. You might be able to come up with your own conclusions by reading the parts of the article which describe the working mechanism of the V-B, and comparing them with Ian’s description of the ShKAS in this post. It is intriguing that French General Berthier, who came up with the original design, had taken it to the USA for development as the M1917 (not to be confused with the Browning M1917 30-cal. machine gun). 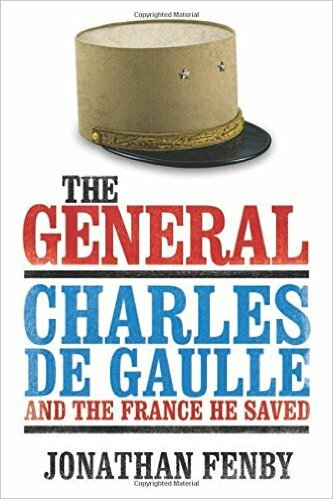 The US Army realized that it needed more work than they were prepared to sponsor, so they ended their relationship with General Berthier, who then took it to Vickers in England after he had made some design improvements. Vickers saw that it had great potential but needed additional refinements to make it a viable yet cost-effective mass-production gun, and they applied their manufacturing expertise to it. Since very little funding was available in the 1920’s for defence purposes in Great Britain, Vickers bided their time and continued improving, testing and refining the V-B until it was close to perfect. In the end, the V-B was a weapon that was on par in terms of functionality, reliability and quality of construction with the Bren LMG, which followed an almost equally prolonged development path starting with its Czechoslovakian ZB26 ancestor. In the end, after exhaustive comparative trials, the British Army selected the Bren as its new-generation LMG, which just edged out the V-B in the process. However, the Indian Army (remember, this was when India was still a British Colony and the Indian Army was led by British expatriate officers) decided it could not wait until the British Army order for the Bren was filled before its turn for re-equipment came, and so it decided to go ahead and fill its LMG requirement with the V-B. In addition to Vickers’ own production, the gun was made under licence to the same exact specifications by the Ishapore Rifle Factory in India, and earned an excellent reputation on the battlefield. Externally it resembled the Bren and is often mistaken for one even to this day. The famous Vickers K or G.O. 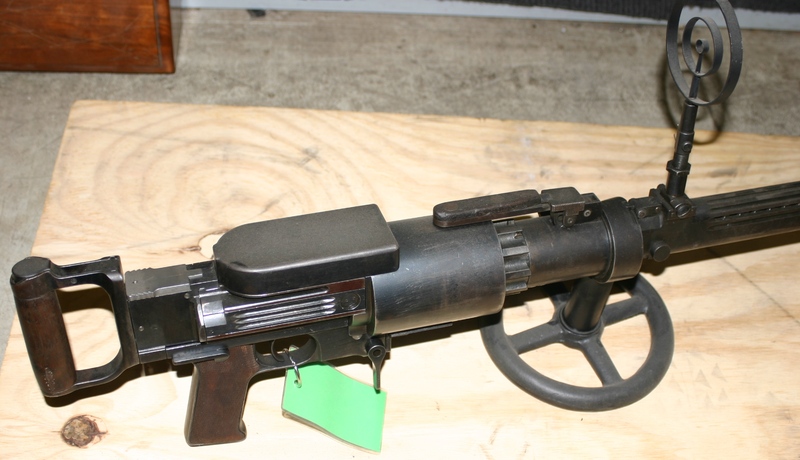 (Gas-Operated) machine gun was a modified V-B designed for aircraft use, complete with spade grips (instead of the original pistol grip0, feed from a 100-round flat drum (in place of the V-B’s 30-round top-mounted magazine) and increased cyclic rate of fire of 1050 rds./min. (up from 600 rds./min.). It weighed 21 lbs, exactly one pound less than the V-B. Right on, Chris. Another set of excellent reference publications from way back that fulfilled a similar niche was the “Profile” series, which was published in the UK and readily available in most Commonwealth member nations when I was a child. They covered everything from combat aircraft through tanks to naval vessels, and were concise yet packed with useful information and photographs, some quite rare. I also have a bunch of the Profile books. They were an excellent reference as well. I used to get them from a long defunct hobby shop on W. 103rd St. in Oak Lawn, Illinois. The also defunct main Kroch’s & Brentano’s on Wabash Ave. in the loop had a good selection of both Doubleday and Squadron books. I probably got my copy of Squadron’s(?) Halbkettenfahrzeuge (half-tracked vehicles) there. It’s getting harder and harder to find real stores that carry serious books of any kind, be they about firearms or aircraft. The demise of Borders certainly hasn’t helped that. The only place to get Schiffer aircraft books in all of Cleveland (to my knowledge) is Wings Hobby Shop in Lakewood. Nice to see that we have plenty of common interests here. How about trying out Historic Aviation ( http://www.historicaviation.com ) in Minneapolis, MN, Sky Books International ( http://www.skybooks.com/international.asp ), Carwin Action Books from S. Carwin & Sons in Canoga Park, CA (I’m not sure if they are still in business today), the Osprey series, Presidio Press or Arms And Armour Press ( including the Warbirds Illustrated series ), to name a few? I know that I’m probably preaching to the choir, but I figured I’d mention them anyway just in case it helps. I was a fan of the defunct Aviation Usk. They were an excellent source for serious aviation books, including the book on my favorite inter-war biplane, the Avia B-534. That was another interestingly armed aircraft, equipped with either four rifle caliber guns (I’m not terribly well informed on Czech aircraft guns) or an engine mounted 20mm Hsipano(?) cannon. The Avia B-534 was one of the most under-rated aircraft of the inter-war years. Quite an airplane, from what I’ve read. Speaking of aircraft publications, have you already read “A Higher Call”, by Adam Makos? I just finished it and was very moved by the humanity and code of honor in the face of impossible odds that so many of the Luftwaffe’s “Experten” lived and died by, often at great personal cost to themselves and their families because they were constantly under suspicion of treason by the SS and Gestapo. I am really glad that, so many decades after the end of the Second World War, one of many truths about “the other side” is gradually emerging from the fog of a history written mostly from the point of view of the victors. I wrote a short review of the book on amazon.com under the moniker “DiverEngrSL17K” if you’re interested. The Avia was at the pinnacle of biplane fighter development. Only the Polikarpov I-153 and the Grumman F3F were really in its class, and they both had retractible landing gear. In fact, the Avia was only marginally slower than the early Bf-109s, and more heavily armed. Numbers of them were taken on by the Luftwaffe after the takeover of Czechslovakia. Others were provided to satellite air forces, including (if I remember correctly) Slovakia and Bulgaria. Do you know if there’s anything in print on pre-war Czech aircraft armament? I don’t know offhand of printed articles or whole publications dealing specifically with pre-war Czechoslovakian aircraft armament. What I’ve come across is mostly incidental to Czech aircraft development, so we’re looking at side chapters here, but I’ll keep an eye out for any material on the subject. Is it true that the chamber has a fluted neck section ? It is difficult to see unless you pay for a Scribd subscription. I really want to hear this thing fire now! 1800rpm of 7.62x54R would be quite the sound! How about the 2800 rds./min. of the Ultra-ShKAS or 3000 rds./min. of the Savin-Norov? :). Only one big problem — it’s going to be very complicated ( although probably not impossible ) to get ahold of a working example of any of these guns, then getting all the necessary permits and clearances for whichever countries it is to be exported from and imported into respectively for the firing demonstration.